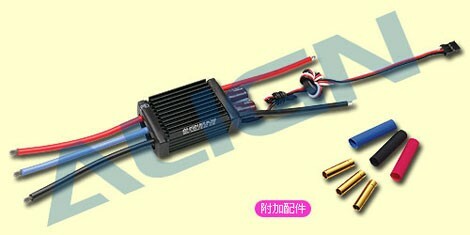 Large-sized high efficiency heatsink makes the ESC stable under large current output. 5-6V step-less adjustable BEC output allowing custom voltage setting to match servo specification. rating of 3A, and burst rating of 5A. Include soft start and governor mode. Small and compact PCB design for lightweight and simple installation. Large heat sink for optimum thermal performance. Highly compatible to work with 98% of all brushless motors currently on the market. Ultra-smooth motor start designed to run with all kinds of brushless motors. The power inlet utilizes a Japanese made "Low ESR" capacitor in order to provide stable power source. The throttle has more than 200 step resolution that provides great throttle response and control. Supporting motor types:2~10 pole in/outrunner brushless motors. 1.When setting to the Quick response speed, theacclerative peak current will increase. 2.To minimize possible radio interference induced by switching power system, BEC should be installed at least 5cm away from the receiver.The use of PCM receiver is recmmonded.